(L-R): Wayne Leeloy, John Allen, John Barker, Jewel Coburn, Randy Wachtler, Michael Martin, Jill Napier (Admin. Director/AIMP), Walter Campbell, Ariel Hyatt, Marcus Whitney, David Ross, Denise Nichols and Kevin Lamb (President, AIMP). AIMP, the Association of Independent Music Publishers sponsored a sold-out luncheon/social media panel on Feb. 20 in Nashville at ASCAP, titled Reap The Rewards. Bios for the panelists and moderator can be found here. Participants included John Barker (@clearboxrights), Ariel Hyatt (@cyberpr), Wayne Leeloy (@fmgnow), Marcus Whitney (@marcuswhitney) and moderator David M. Ross (@davidmross). 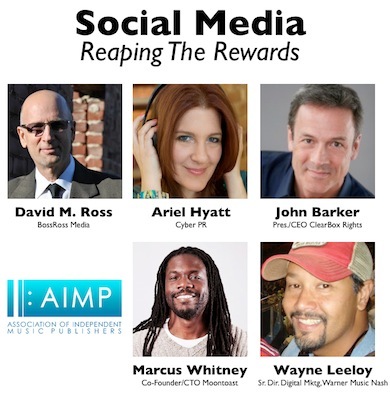 Ariel Hyatt: A big problem arises when we put the word “reward” anywhere near social media. There’s a giant conversation at every level from Fortune 10 companies to tiny independent artists like the type my firm represents—“What’s my ROI? If I’m going to spend a herculean amount of time Facebooking, Tweeting and more then how much money am I going to make?” This is like asking how much money do I make if I go to a great holiday party or to the gym. You don’t do those things to make money. You go for other reasons and there is a halo effect that happens and eventually money will happen. Especially, if you are a publisher, you need to realize that making an investment in this space will take money even though the platforms are free. Strategy takes money, and you won’t necessarily see the money come out the other side on a one-to-one basis. But everyone on this panel will tell you social media has helped us in ways that are incredibly tangible. I’ve been to Iceland, Norway, Denmark and Australia because of Twitter. I didn’t realize where it might lead the first day I hired someone to teach me how to use it in 2007. I sat at my desk hysterically crying because I thought it was the stupidest thing. For those of you in a state of panic because you didn’t come to the party in 2007, don’t worry. There’s still plenty of time to get your strategy right. Wayne Leeloy: Define what you really want to achieve. A lot of folks are trying to build an audience and create awareness around a tour, a record release, a brand, or a product. But as publishers, “awareness” may be the biggest reason to leverage social media. Social gives you a simple platform to share. When thinking B2B, it’s not so much about how wide I cast my net, but how detailed I make my content. It’s a more targeted conversation. Marcus Whitney: My social networks involvement is more on the technology side—watching these platforms grow in influence and dominance and evolve as businesses. MySpace was the genesis of social networking at scale. At its height in 2008 (100 million users), it clocked annual revenue of about $800 million but soon suffered a steep decline as it faced competition from Facebook (FB) which left the college-only segment and expanded into the larger population. By way of comparison, FB’s most recent Q4 revenue was $1.53 billion and they have a billion people on the platform (631 million active users every day). Another big difference is MySpace let you sign in with an alias, but FB requires your real name so you end up connecting with your family, saying when you are engaged, celebrating your birthday. It’s created an identity infrastructure that we’ve never experienced before. And mobile access to FB has outstripped desktop access, so FB is becoming a primary method for communication. Then there’s the revenue piece. Of FB’s $1.53 billion in revenue, 95% of what they earned was in advertising and 25% of that was from mobile ads. You used to be able to reach 100% of the people that liked your page on FB, but now you can at max reach 15% of them without paying. Twitter is introducing a similar system. These platforms are the new identity and communications infrastructure utility and totally wired into everything we are doing. FB is also a commercial entity on the public market and therefore has to make money. These considerations are important when you think about a strategy for using these tools today and over the next 2-5 years to make connections and capture data that will be valuable to your business. Ross: Except for LinkedIn, you don’t get to capture data about your social media connections. What strategies can we use to counter that? Hyatt: Who uses email every day? [everyone] So the plan is not just tweeting three times a day or Facebooking for 15% of everyone to see it if we are lucky. Where’s your email list, newsletter and website? A few publishers have called us lately wanting to catch up with other companies who are good at social media. When I’m running strategies and writing plans I notice the sexier companies are establishing themselves as thought leaders for their specific area. A thought leader is someone doing something cutting edge and worthy. The overarching reason you want to get into this is to establish yourself as a thought leader in whatever domain you specialize in, even if it is only for 50 people. Ross: Let’s look at a few examples of people in the community using these tools. Publisher/writer manager Dale Bobo represents hit songwriters and sends out a monthly newsletter. “It’s about raising the profile of my writers in the industry,” says Bobo. “I try to tell a story, make it fun and involve the community.” Twitter is his network of choice but he also uses Soundcloud for music links. Panelist John Barker started his company blog and newsletter in December. John Barker: Most of the people on this panel are early adopters, but I’m definitely not one of them. Ariel learned Twitter in 2007, I learned it ten weeks ago. I got her book, Music Success In 9 Weeks where she talks about setting goals and becoming recognized as a thought leader. ClearBox is a new company. Many people just didn’t know about us, so we hoped to connect with the focused few potential clients, which in my world means publishers, songwriters and people who own intellectual property. Consumers are not important to me right now. Rather than going after the thousands I’m going after the hundreds. About ten weeks ago we connected our website to a FB company page, started a Twitter account, introduced a WordPress blog section and began reaching out to people on LinkedIn. We are trying to blog once every week and become a thought leader that people will recognize and think about when they have issues or interests in the area of copyright administration or publishing. So far we’ve done about a dozen blogs. Ross: How did you begin your email list? Ross: John, it’s great to see someone getting down and dirty and making social media work for them. Leeloy: For folks that don’t come to social naturally there is an intimidation factor and a learning curve that can stall the process. You’ll see hundreds of bells and whistles that pop up every day, but you just need to discover what works for you. Make it your own, find your voice and people will respond. Whitney: It is much easier to build habits when you set goals you can achieve. Make the hurdles low early on. Once you begin creating content, social media becomes just part of the picture and it gets harder to pinpoint exactly where the benefits are coming from. Blog posts create better SEO. People begin sharing your work on FB and you are pushing out to Twitter. Eventually you become a channel people tune into for a unique kind of information and/or perspective. You begin shaping the conversation and it drives so much business. Hyatt: But remember, if all John blogs about is his goals, his work, and focuses on just one thing he could be tuned out quickly. There needs to be a part of him we feel connected to. This doesn’t mean sharing inappropriate private things. But something. Is there a charity you support, are you spiritual? Do you bake or eat healthy or have a great dog? These are all things people like. You might be having a conversation on one level that is interesting, but has lots of big words. I’m interested, but perhaps not quite ready to commit at that moment. But when I see a photo of a chocolate Lab now I can relate cause I have one too. On average the open rate on a good newsletter is about 15%. But remember the 15% that open it in January aren’t the same ones opening it in February, so consistency is key. Ross: I like to paraphrase what Ariel and Wayne just said as, “Be personable but not personal.” What we haven’t talked about is frequency. Should my newsletter come out every day? Once a week? Do I tweet five times a day? Always at the same time? Leeloy: Frequency will vary from audience to audience. Make sure you have something relevant to say. Organic and natural often works best. For example if something is happening with one of your writers, celebrate or congratulate them. Don’t beat people up, but make them aware. Hyatt: There is a science to social. The average FB post lasts about 2—2.5 hours because the average person has about 130 friends and that is how long a post will hover on their wall, if they see it at all. The average Tweet lasts about 45 seconds. You really can’t over tweet. For those tweeting every three days, no one is seeing it, I promise you. Heavy tweeters tweet as much as 22 times a day and can have millions of followers. Understanding who your followers are and when are they looking at this stuff can also be measured. I recommend Crowdbooster.com for example. It’s an app that shows the best times to tweet, when the most followers are on your stream. Another fact is that 90% of the uplift that has happened on FB posts in the last quarter came from visual images, not videos. So get photos into what you are sharing. Another thing we found is that company pages on FB tend to have a lift between 8 pm and 6 am. People are at home at night, they put the kids to bed and tend to have some free time to surf. If you are hiring a social media management company make sure they work at night so your company can respond when necessary. If you are going to invest, keep on top of the science, too. Whitney: Some people get depressed because they post with the expectation their content is deeply engaging, but no one responds. Some stuff sticks and some doesn’t. Don’t be too attached to the outcome of any one tweet. These are technology platforms and they have bugs. There can be reasons why someone didn’t see your post that might not have anything to do with you.